Thematically, all of these compositions share a common thread; they each represent ideas, notions and works of art that were important to Ben as a child and remain important to him today. Play was on his mind when composing these pieces. Ben chose comics, movies and imaginary worlds that inspire him. “Grown-ups” don’t spend a lot of focus on the things they liked as a child, because they’re too busy being adults. Often they don’t like what they do, but still do it because it’s the easier choice in our society where if you have money, which often means stability and less opportunity for play, you’re happy. It seems while it’s not always the easiest choice to be a musician, those that keep doing it have placed a priority on playing, and play. Through ‘Captain Awesome’ we see one of Canada’s rising talents share his own personal journey through his music. 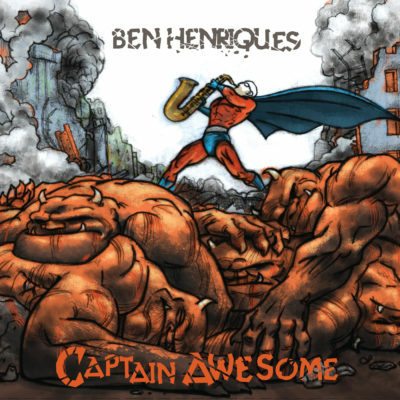 Accompanying Ben on this album is a group of musicians considered by all to be jazz masters. Josh Rager on piano, Kenny Bibace on guitar, Fraser Hollins on bass and Dave Laing on drums. Together they create a sympathetic vibe to Ben’s tunes and take the listener on a musical journey with elements of the Jazz tradition, modified with Ben’s compositional flair.